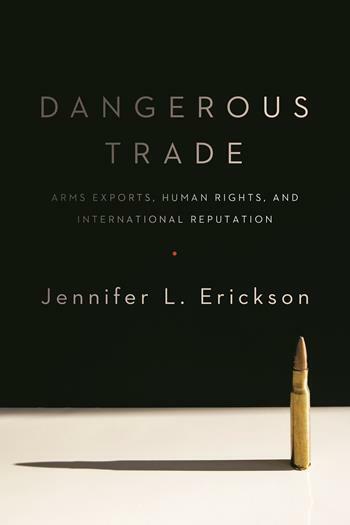 Jennifer L. Erickson’s Dangerous Trade is a powerful reminder of the manifold ways in which arms control raises the most enduring questions in the study of international politics. The ability to regulate violence capacity on a given territory is central to the very idea of the modern state. The unfettered capacity to wield organized violence externally in pursuit of collective interest is the central preoccupation of governments. In the middle of the last century, thinkers such as Bernard Brodie, Henry Kissinger, Thomas Schelling, and Hedley Bull were preoccupied with the special incentives nuclear weapons might generate to overcome barriers to cooperation in anarchy and accept limits on states’ violence capacity in their own (and the world’s) best interest. As scholars such as Robert Jervis and Charles Glaser later made clear, however, explicit or implicit inter-state cooperation on conventional arms control could play a critical role in moderating the security dilemma. Those works and the studies they inspired bore deep into the core questions of security-seeking and cooperation under anarchy, but often abstracted away from important related question of domestic politics, the origins of state interests, and the role of norms and ideas in inter-state relations. Subsequent lines of research began formally to incorporate domestic political incentives, and, inspired by the landmark collection edited by Peter J. Katzenstein, The Culture of National Security, collectively held ideas and norms. On the night of November 9, 1989, it was apparent to everyone on the scene in Berlin, and to spectators across the world, watching on TV, that history had reached a turning point. The ramifications of the opening of the Berlin Wall, as was also widely understood at the time, would not be limited to central Europe, but would reverberate around the globe. A little less than a year later, U.S. president George H.W. Bush, addressing Congress, articulated this understanding in calling for a ‘new world order.’ Separating this phrase both from its rhetoric of Cold War triumphalism and the various conspiracy theories that have grown up around it, I would suggest that the 1990s actually did see the development—tentative, hesitating, contradictory and incomplete—of a new world order, one reflecting the turbulent events of 1989 across the Eurasian land-mass, as well as the aspirations that propelled these events, the promises of 1989. But by the end of that decade and the beginning of the new millennium, a reaction to that order was beginning to emerge, which would strengthen across the early years of the twenty-first century. The two political upheavals of 2016, the Brexit vote, and the election of Donald Trump as American President, are major signs of the triumph of that reaction, the end of the new world order, and the failure of the promises of 1989.